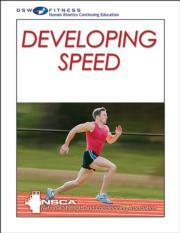 Developing Speed by NSCA covers assessment and the application of speed training to eight specific sports and provides all the tools needed for maximizing speed. Identify the factors that contribute to speed and the science behind effective speed performance. Explain the technical differences between maximum speed and speed as it relates to an athlete’s ability to improve performance in a variety of sports. Identify the technical requirements for developing high-level running speed. Evaluate speed in athletes using a variety of assessment tools. Design safe and effective training programs for speed to meet specific goals for a variety of sports and activities. Implement a variety of drills and exercises to develop speed to maximize athletic performance. Speed has long been recognized as a key component of superior sport performance. Whether chasing a long pass in football or sprinting down the court on a fast break in basketball, a player requires speed in overall ability. Now with the Developing Speed course, professionals can develop their clients’ speed for elite athletic performance. Based on the book of the same name written by eight of the National Strength and Conditioning Association’s top experts, this course is packed with research and recommendations, making it the definitive resource for creating scientifically sound training programs that take speed to the highest level. Using assessments, drills and exercises, and program design, professionals can develop customized regimens or choose from one of the eight sport-specific applications of speed training: baseball, basketball, football, ice hockey, rugby, soccer, tennis, and track. The Developing Speed Print CE Course is an invaluable resource for strength and conditioning professionals seeking to help clients increase speed and blow past the competition. "The tools and resources compiled by the top experts in the field of strength and conditioning do a tremendous job of targeting the performance needs of multiple sports. If you're looking to increase sport-specific speed, Developing Speed has everything you need!"